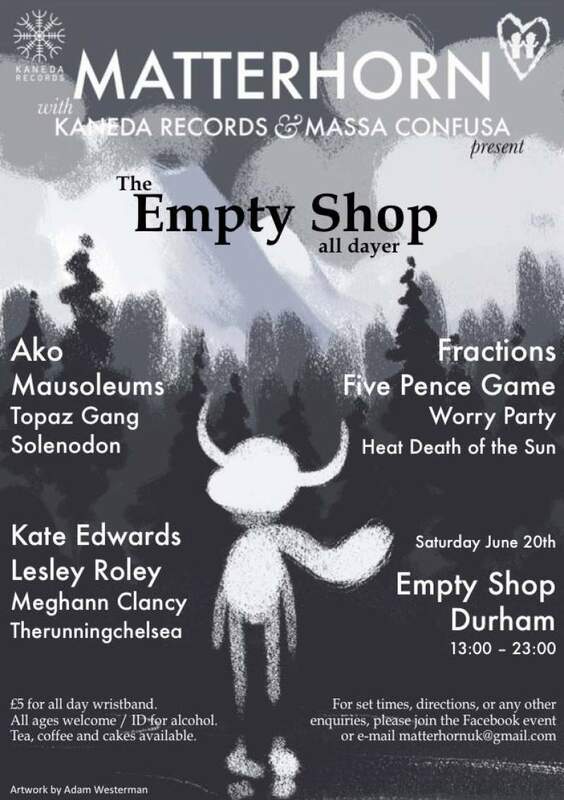 Fun-loving music promoters Matterhorn present a perfect partnership of electronic and acoustic music on Saturday 20th June, with an all-day event at Empty Shop HQ in Durham. Cakes and afternoon tea will accompany the afternoon acoustic sounds, with performances from folky popstress Agerskow and multi-instrumentalist Meghann Clancy; as the day draws on the music will become progressively noisier thanks to sets from loop maestro therunningchelsea, experimental electronica from Solenodon, Worry Party’s retro synth pop, glitch-hop from Topaz Gang and Eugene Davies’ beautiful post-rock. The evening headline sets notch things up a gear, with dark synth pop from Fractions and awesome electronic rock from Five Pence Game. And the price for all this musical loveliness? A mere fiver. It’d be rude not to go! The Matterhorn All-Dayer takes place at Empty Shop HQ, Durham on Saturday 20th July.